As a mythologist, I’m intrigued by this Esper. I suppose, since it never becomes a regular summons in the game, they used a throwaway name as opposed to one of the “named” summons of Final Fantasy mythology like Shiva, Ifrit, etc. It’s still pretty rare to come across a monster/summons in FF that’s not from mythology. Tri- is obviously from Greek “three,” and it has a Tri-Disaster (three-element) attach. Not sure about -och. 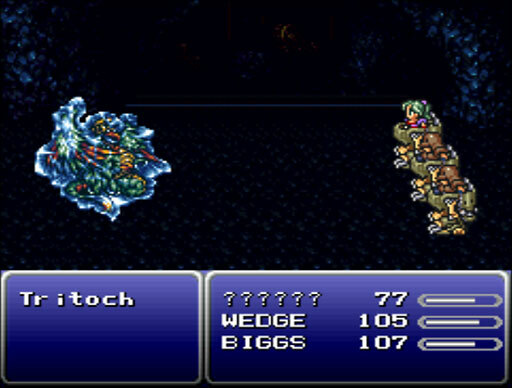 The name “Tritoch” appears in the SNES/PS1 versions of the game; in GBA, it’s called Valigarmanda, another nonsense name that appears to be some sort of riff on Garuda.